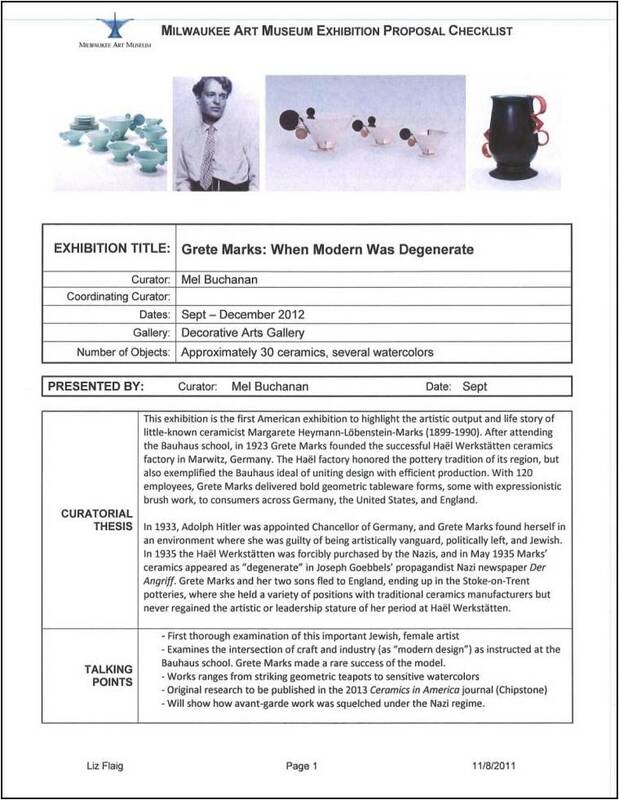 “Grete Marks” exhibition committee formal proposal, front page. In the first two posts of this series, I’ve addressed the origins of the Milwaukee Art Museum’s Grete Marks: When Modern Was Degenerate exhibition (on view September 6, 2012 – January 1, 2013). The exhibition went from my admiration of a certain artwork I didn’t know well, to years of background research to learn the context and nuance of the artist’s story. In those steps, I looked at artwork, read about Bauhausian ideas, and traveled to Berlin and London to meet with curators and examine stunning teapots. For the next part of the task of making the exhibition, I mostly sat at a computer in Milwaukee generating forms and writing emails. An exhibition goes from a curator’s idea to a museum reality through a series of approvals up the chain-of-command. To bring my personal research on Grete Marks into a real Museum exhibition, I first spoke with my curatorial colleagues and the Museum’s Chief Curator about the idea. With our internal team on board, and a firm idea of what the show will include and its budget, each curator makes a formal presentation to the Museum’s Exhibitions Committee, a sub-set of the Milwaukee Art Museum’s Board of Governors. For my presentation, I prepared the document you see above that shared images of Grete’s work, told the outline of her training at the Bauhaus and the persecution of her designs by the Nazis, argued why it was important to share this story with our Museum audience, and proved that we had an idea of how much it would cost and how we could pay for it. With a series of “ayes” around the table, the Exhibitions Committee formally approved the proposal at their September 2011 meeting, and the Grete Marks: When Modern Was Degenerate exhibition dates were set for the 2012-13 exhibition year. At that point, the curator’s work can almost be described as a split between tasks that advance the direct installation of the show (continuing research, setting the checklist, negotiating loans, balancing the budget) and preparing other staff for the their parts in the exhibition (raising money with the development office, planning for the press contact, training educators). 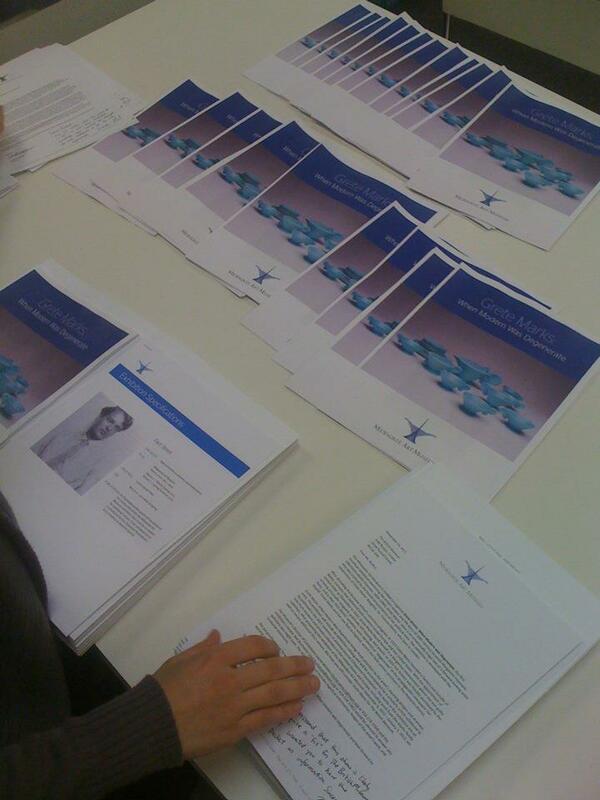 “Grete Marks” exhibition packets that were sent to other Museums to seek partners. Photo by Mel Buchanan. I worked with the Museum’s Communications Department–mainly Public Relations manager Kristin Settle–to incorporate a few short lines about the exhibition into the Museum’s “long lead,” a document that goes to local and national news outlets about a year in advance announcing the Museum’s major exhibitions and programs. Close to the exhibition opening, we put together a dedicated “Grete Marks” press release with clear and basic information on the exhibition, which you can read here on the Museum’s website. This version of the exhibition story is modified slightly in order to deliver concise “sound bites” and direct quotes that a newspaper could pick up. 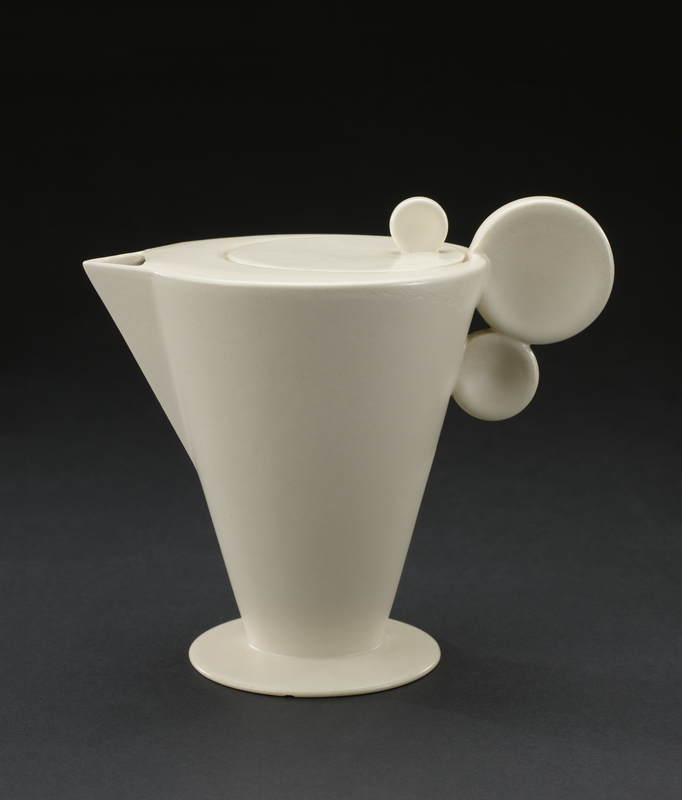 “The Modern ceramics created within Marks’ Haël Werkstätten, with their machine precision, expressive brushwork, and attention to vernacular German traditions, show the Bauhaus teaching’s thorough influence on the artist,” said Mel Buchanan, Mae E. Demmer Assistant Curator of 20th-Century Design. It feels very odd to write about yourself in the third person. Another task along the way was selecting and procuring images that we could share with the press. Fortunately, I had a brilliant intern named Lydelle Abbott to help with this project of securing image rights. When a magazine or newspaper wants to cover a Museum exhibition, we want them to have easy access to images that are “pre-approved” for press use. I personally am a bit of a control nut (perhaps all curators are), so I was very engaged in exactly what images of which Grete Marks artworks would be released to news outlets to tell the visual story. Grete Marks (German, 1899–1990), Haël Werkstätten Factory (Marwitz, 1923–34). Coffeepot, ca. 1930. Minneapolis Institute of Arts, The Modernism Collection, Gift of Norwest Bank Minnesota, 98.276.122.1a,b. In a world where images are so easy to grab off the internet, scan from a book, or pin to your Pinterest board, it can be surprising how many steps and complications are involved in properly securing high resolution images of artwork with copyright permissions. We approached the institutions that owned each object and arranged permission through their Rights & Reproductions departments to use the image for press purposes. They make sure we were sharing the proper credit line for the artwork (usually the fund or donor to the Museum–like the Norwest Bank of Minnesota on the image at right), as well as the photographer’s information. Additionally, you may have to go through the artist’s family or foundation, sometimes managed by a large group like the Artists Rights Society, to get clearance with the holder of the copyright. I had to go through this entire routine again to get permission for images that we’ll use in the exhibition itself (like using a photo blow up of this famous Bauhaus educational graph by Walter Gropius on the wall of the exhibition) and later when I go about publishing images alongside my research in an academic journal. About one year before an exhibition opens, the curator presents the story to the museum’s “program planning” committee. This group of educators, events team, communications staff gather to learn the basics of a given upcoming show, and then brainstorm different ways we can plan programs and events around its theme. For Grete Marks, we devised a 3-part lecture series about the plight of art in the era of Nazi Germany in cooperation with the Sam & Helen Stahl Center for Jewish Studies at UWM, along with a MAM After Dark highlighting female artists, a special tour for Museum Members, a series of Gallery Talks, a book salon, etc. For bigger shows, this is the chance for, say, the chef to start thinking of themed dishes for the cafe. As a curator, this early “Program Planning” presentation gives you a great early in-house audience to test what parts of the exhibition ring clearly, and which parts of the message are maybe a little more difficult to present to a crowd. For me, it was during this presentation that I saw how including more information about Grete’s Bauhaus training would help visitors understand the story. I saw that I’d been using the word “Bauhaus” as short hand, instead of taking the time to carefully explain what the school taught and the influence it had on Modern art and design. 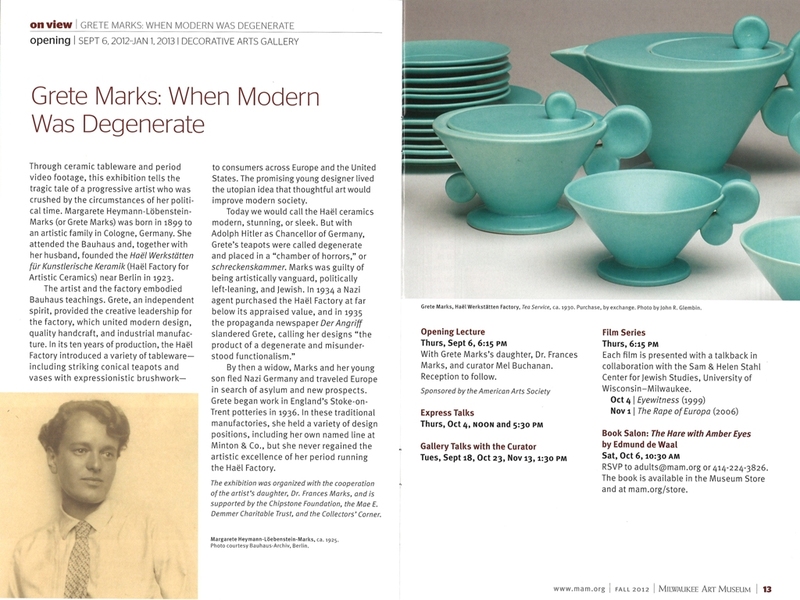 The Museum’s “MAM Insider”, fall 2012 issue. Pages 12 and 13. Starting about six months before the show, as a curator you hit a series of deadlines for content for things like the museum’s website, any rack cards or collateral that will be printed, or a short article in the MAM Insider (shown above). The most important process during the lead up to the exhibition is working closely with the Museum’s registrar Dawn Gorman Frank to arrange for the loan of artwork. The process of loaning artwork from another institution starts at least 1 year in advance, and often several years in advance for a major artwork that is highly “in demand,” like a painting by Georgia O’Keeffe or Wassily Kandinsky. For my exhibition, I sent personalized letters and a loan form to the director and curator of each institution from which I was requesting artwork. I explained the thesis of my exhibition, the value of the particular artwork I was requesting, and provided logistical information like the dates of the show and insurance coverage. Dawn followed up to provide records of our Museum’s facilities in terms of HVAC and security, and to begin estimating the cost for shipment and packing. The loaning institution reviewed our information, considered how the request fits into their plans for the artwork, and either approved or denied the Milwaukee Art Museum’s loan request. Once approved, the registrars from each institution work together to discuss specifics of packing (building crates), shipment schedules, and sometimes the need for a courier to travel with the artwork. With all the information in agreement, each party signs a loan document that stays on file. With all the foundation work laid to allow other Museum staff to advance with their parts of the exhibition (drawing in the press, raising funds, planning programs), as curator I moved on to the hands-down most fun part of my job. It was time to work with the exhibition designer to lay out and design the exhibition itself. Stay tuned! This entry was posted in Art, Behind the Scenes, Curatorial, Exhibitions and tagged Behind the Scenes, curator, Exhibitions, Grete Marks. Bookmark the permalink.